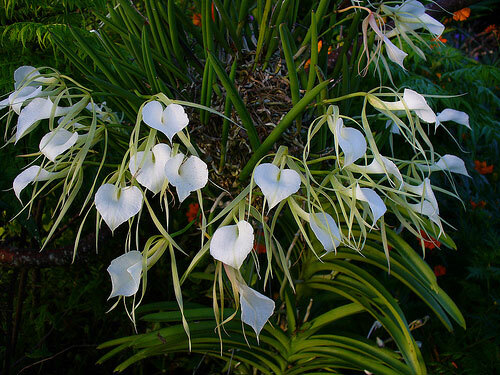 Brassavola nodosa, the Lady-of-the-Night Orchid, smells of citrus at night to attract a nocturnal moth. Like other Brassavolas, they like similar care to the related Cattleya orchids. Their range in the wild includes Mexico, the Carribean, Venezuela, and Peru. Give them warm temperatures to keep them happy. 75-80°F (24-29C) works well during the day, and there should be a 10-15°F drop at night (6-8C). Let them get dry in between frequent waterings. Use a very well-drained potting mix, such as coarse fir bark or wine corks, to achieve this. They are often mounted on slabs of bark to achieve the same result; this works well as they get more air to the roots as well, but they'll need daily watering. Fortunately, they look really attractive this way. It looks a lot like how they grow as epiphytes in the wild, and there's nothing quite like a big ÒballÓ of leaves and flowers sticking out of a piece of bark. They can deal with as little as 40% humidity, but will be happier at 50-70% humidity. Humidity is especially important if they are grown mounted. They grow quickly with proper care, so you'll soon have very many flowers each time it blooms! These are easy orchids to care for; it's no wonder they're so popular.